Riches of the Nile is a brand new casino and the latest destination the Viking has visited. This casino is based on ancient Egypt and more specifically the Nile. The casino offers the player the chance to explore the Nile and see what treasures they can find. Throughout this review, the Viking will be bringing his readers all the information he can about this casino. His followers will be glad to hear that the UK Gambling Authority licenses and regulates this casino. The casino also supports mobile and tablet devices so that players can use their casino when they are travelling. Whilst exploring Riches of the Nile the Viking found they offered players a welcome bonus. On your first deposit, you will receive bonus funds. It also contains spins which players may use on a selection of slots. At this casino, you will have to use an opt-in system to gain access to any further promotions. They will be emailed to you and may include spins, deposit matches, and win boosts. If you enjoy getting rewards for being a loyal customer then you need not look any further than Riches of the Nile. Their VIP program offers players exclusive rewards like faster withdrawals, a personal account manager, Birthday bonuses, surprise bonuses, and invitations to exclusive events. It is good to remember that you can only get into this program by an invite. 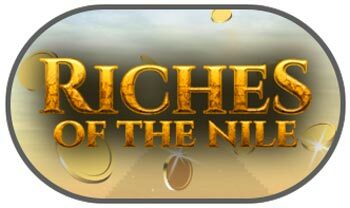 As with most new online casinos, Riches of the Nile offer players the chance to try games in a demo mode. This gives you the opportunity to play a game and see if you like it before having to use funds. They also provide the player with a range of different games to play like, Blackjack, slots, roulette, table games, live casino, and more. The games at Riches of the Nile are supplied by Netent and PlayNGo which as most players will know are renowned for developing great games like Starburst, Book of Dead, Divine Fortune, Battle Royal, Hotline, and many more. Riches of the Nile accept a lot of different payment providers. Including the likes of PayPal, Neteller, VISA, MasterCard, and Skrill. Make sure to read the terms and conditions for your prefered payment method before making an account. Riches of the Nile offer users three different support options. An FAQ, live chat, and an email contact form. The live chat option is a great way for players to contact a member of the support team. Although here at Riches for the Nile the live chat option is only available during selected hours. Overall the Viking found Riches of the Nile to be exactly what they had said it would be a great adventure. The casino is user-friendly and has a unique theme that sets it apart from other online casinos. The Viking also loved that he has the option to play at this casino whilst he is travelling via a mobile or tablet device. If you have ever wanted to follow the Viking on an adventure then there is no better place than the Nile. You can just click the link above and set sail to Riches of the Nile.